2016 has been a special labyrinth year for me. It wasn’t my intention, but it just happened. I hadn’t planned to give many labyrinth workshops, needed my rest and wanted to ‘just’ travel through Italy, my motherland. But the labyrinth – and its wisdom – crossed my path at unexpected moments. 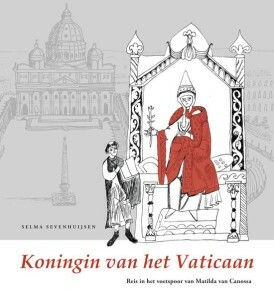 It started when I arrived in Canossa at the beginning of April. Much to my pleasure Matilda’s heart labyrinth was still laying there, under her famous castle. During my two weeks stay in Canossa I had a lovely unexpected meeting with labyrinth colleagues Jef and Kimberly Saward and Lisa Gidlow Moriarty, who were traveling through Northern Italy. What a place to connect, in Matilda’s heart! 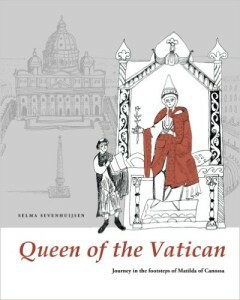 From Canossa I traveled to Ravenna, to see the famous labyrinth in the San Vitale in Ravenna. Much to my surprise it was a walkable labyrinth, and since it is laying on a strong energy spot I felt a deeply healing effect, a real home coming. 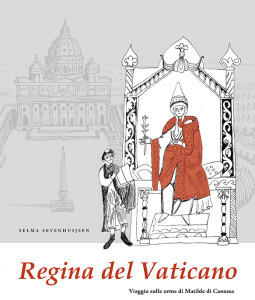 During my stay in Canossa I also travelled to Mantova, as always wanting to renew my deep connection with Matilda’s place of birth. This time I decided to visit the Palazzo Te, and yes, in one of the rooms I suddenly walked over a mosaic floor with 12 labyrinths. After Canossa I decided to stop in Pontremoli, to see if I could finally find the labyrinth with the knights that I had often seen on pictures. 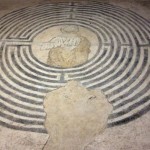 An Italian friend was so kind as to guide me to the S. Pietro church, where a Chartres-type labyrinth is hanging on the wall. It’s always touching to see such a treasure in the real, in this case especially so since in the centre is engraved an IHS, the acronym for Jesus. Most special, though was my visit to Alatri and Ceccano, where Italian labyrinth colleague Giancarlo Pavat guided me and my friend Agnes van de Beek to the fresco of Christ in the Labyrinth, and told us all what is known about its history and meaning, It is as if Christ himself is inviting you to follow his path, a path that leads to self-knowledge, unconditional love and unity-consciousness. This was underlined by the symbols on the wall around the fresco, especially the small flowers of life, Incredible that this beautiful labyrinth has been preserved over nearly a thousand years, and is so recently re-discovered. It left me in awe. 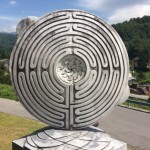 A completely unexpected meeting with the labyrinth took place high up in the mountains of the Appenines, where I nearly bumped into a sculpture of a Chartres labyrinth next to a tiny road. It was put there in the Jubel Year 2000. 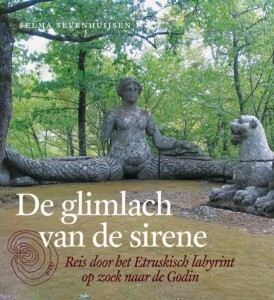 And then – at my end of my journey through Italy, I revisited the labyrint in S. Michele in Pavia, that’s also figuring in my book ‘De glimlach van de sirene’. And every time I see new things…Now it struck me that the labyrinth is laying under a cupola that looks like a stairway to heaven: the labyrinth prepared the pilgrim for the Assumption, as the guardian of the church explained to me. I realized that the labyrinth in Ravenna is embedded in a similar architecture. And then, after my return in the Netherlands, the special experiences continued. 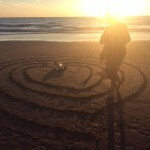 I made several heart labyrinths on the beach, with friends – like this one at the september Equinox. I followed a remarkable Labyrinth Wisdom workshop with Tony Christie and Fionallua Conroy, at the Schaapshoeve: a deep experience of the Love and Light that the labyrinth can bring us. And in the end I gave a successful workshop about the labyrinth in the church – together with colleague Luis Kaserer. And at several occasions I enjoyed the friendship and inspiration of the growing network of Dutch labyrinth workers. And then there were the little miracles on the path. The discovery that my grandchildren spontaneously want to learn the labyrinth from me. The discoveries, answers and confirmations that I got when I walked a labyrinth, and that by now deeply sink in whenever it happens. It confirmed me that the journey to the centre is a long and winding road indeed, but so incredibly rewarding. The ‘movement inside’ becomes more and more part of myself, also without a physical labyrint. I feel it makes me a better labyrinth teacher with every step I go. This year I have 16 students in my labyrinth training at the Jungian Institute, and I was deeply touched when we walked the heart labyrinth together. 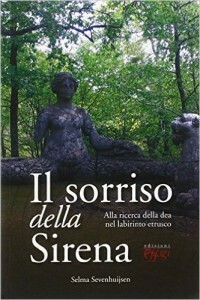 And now, in the last month of the year, I am traveling back to Italy together with my friend Agnes, to receive a premium for my book ‘Il Sorriso della Sirena’, while she gets it for all the invaluable energy work that she is doing in Italy and elsewhere. 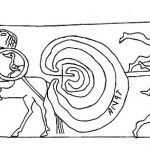 I am traveling back to the Etruscan labyrinth, where so much has started for me. There – in Ceccano – I will meet Giancarlo Pavat again, and Jeff and Kimberley, who also receive the premium. The beginning is the end, and the end is the beginning, as it is in the labyrinth. May the journey continue….